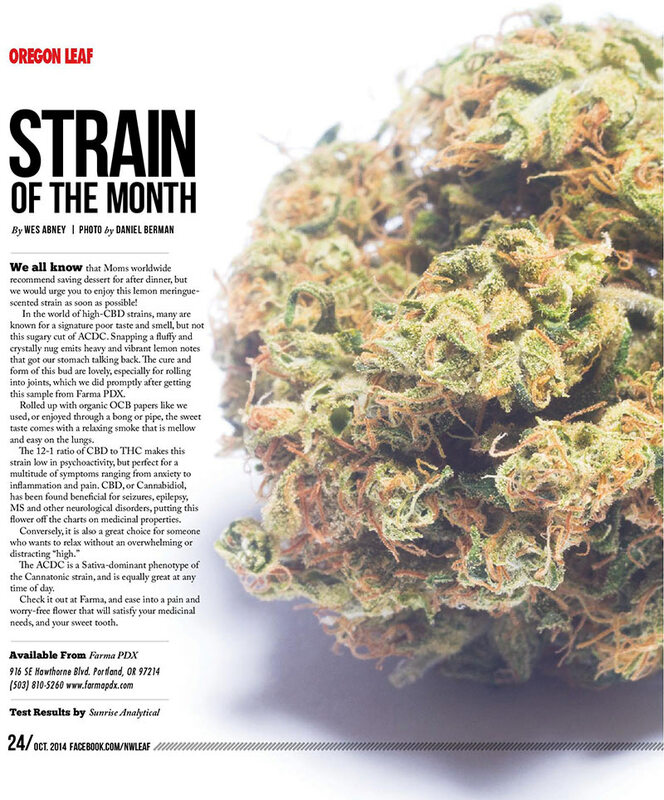 Oregon Leaf Magazine recently awarded Farma’s ACDC as Strain of the Month. We all know that Moms worldwide recommend saving dessert for after dinner, but we would urge you to enjoy this lemon meringue- scented strain as soon as possible! In the world of high-CBD strains, many are known for a signature poor taste and smell, but not this sugary cut of ACDC. Snapping a fluffy and crystally nug emits heavy and vibrant lemon notes that got our stomach talking back. The cure and form of this bud are lovely, especially for rolling into joints, which we did promptly after getting this sample from Farma PDX. Rolled up with organic OCB papers like we used, or enjoyed through a bong or pipe, the sweet taste comes with a relaxing smoke that is mellow and easy on the lungs. The 12-1 ratio of CBD to THC makes this strain low in psychoactivity, but perfect for a multitude of symptoms ranging from anxiety to inflammation and pain. CBD, or Cannabidiol, has been found beneficial for seizures, epilepsy, MS and other neurological disorders, putting this flower off the charts on medicinal properties. The ACDC is a Sativa-dominant phenotype of the Cannatonic strain, and is equally great at any time of day. Check it out at Farma, and ease into a pain and worry-free flower that will satisfy your medicinal needs, and your sweet tooth.